What’s the big deal about the little Leprechaun? No, not the one on your cereal box. The legendary leprechaun that guards his gold at the end of the rainbow. The one that will, supposedly, grant you three wishes in exchange for his freedom—if you’re quick enough to snag one and make him your prisoner. Leprechauns have a long history in folklore. They haven’t always been cute little bearded men, either. Early Irish legends had some pretty menacing characters as leprechauns. It would seem that the Irish would’ve been barefoot if not for the the leprechaun’s shoe making skills. Besides being famous as cobblers and for hoarding gold, they also had a reputation for drinking and deceiving. They were narcissistic tricksters that only looked out for themselves, at everyone else’s expense. 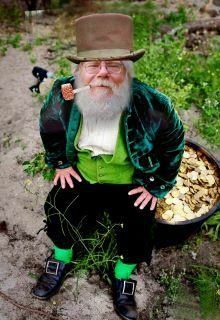 Here’s a link to a short history of leprechaun lore. One thing is certain, if you happen to be lucky enough to meet one of these fellows, watch your back! Leprechauns cannot be trusted. ← Sea Creature in Cambodia?